Kidneys are some of the most important organs in the body. Dealing almost strictly with blood, kidneys control blood pressure, filter out waste and excess water, stimulate red blood cells, and help maintain a proper balance of acids and minerals. Without kidneys, your system is much more susceptible to urinary tract infections, diarrhea, weight loss, and lethargy, among other things. 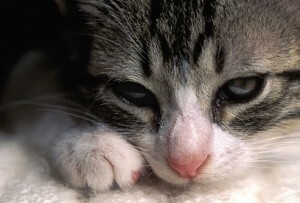 This post will be covering the topic of kidney failure in cats, detailing exactly what it is and how to treat it. There are two types of kidney failure that cats experience: Acute renal failure, and chronic renal failure. Acute failure is usually caused by the ingestion of a poison (like antifreeze or pesticide), trauma, dehydration, blood loss, or infection. It flares up very quickly, and can be deadly if left untreated. If you notice your cat vomiting an unusual amount, urinating less than usual, having a general lack of energy, or experiencing a loss of coordination, take her to the vet right away. Acute renal failure is not hard to cure if it is caught early enough, but the longer you wait, the harder it becomes to treat. The same, unfortunately, cannot be said for chronic failure. Developed by years of wear and tear, kidney failure becomes chronic when the kidney tissue is actually replaced entirely by scar tissue. This condition is untreatable, and is often caused by simple old age, although it can also be brought about by trauma and infection. Life expectancy after diagnosis is a few months at best, and prolongment of life is rare. Treatment of chronic kidney failure is more about alleviating pain than curing the illness, although sometimes proper care can slow the spread of the symptoms. As your cat ages, notice her weight, energy, and urination habits, all of which can indicate chronic renal failure. When treating kidney failure of any kind, diet is the most important thing. Look for a food that has a low amount of high-quality protein, like turkey, duck, or eggs, preferably a limited ingredient food. These are usually single-source proteins packed with beneficial nutrients. Most limited ingredient foods are designed specifically for pets with health problems, so finding the right one to support your cat shouldn’t be a problem. Both kinds of kidney failure can be brought on or aggravated by dehydration. Cats don’t naturally drink a lot of water because in the wild, they get their moisture from the raw meat they eat. Needless to say, they aren’t getting any moisture at all from their dry kibble. Supplementing a canned or dehydrated food every few days will be a good way to ensure that your cat is getting properly hydrated. You can also try mixing some warm water into her kibble. While these methods might not entirely cure kidney failure, they will help your cat’s system fight the symptoms and greatly reduce the pain she is in. Kidney failure is a serious problem and we’d love to do what we can to help you and your cat fight it. Please let us know how we can help by emailing eric.nault@longdogfatcat.com, or by calling one of our stores.